Hello and welcome to a new month! Again we have an opportunity to reassess and tweak our lives to better work toward our goals. We can see what didn’t work and what went splendidly. I love the beginning of a new month, can you tell? 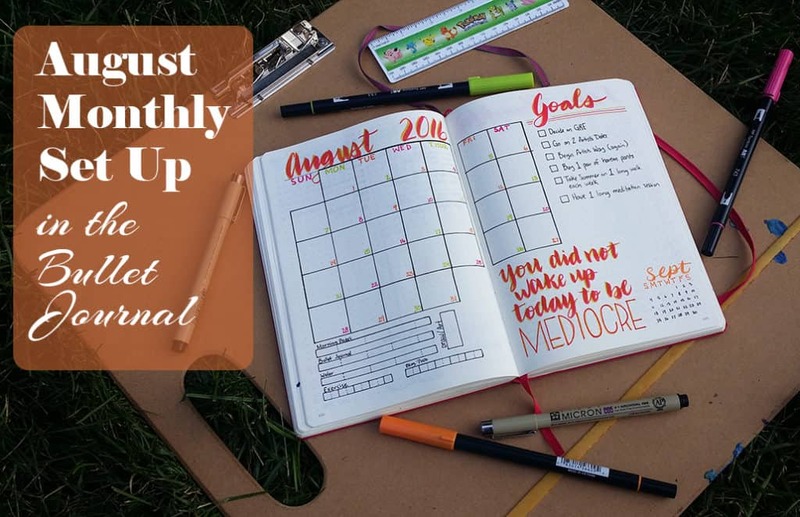 Let’s jump right into my August monthly set up! The first day of my August monthly planner is the calendar, of course. 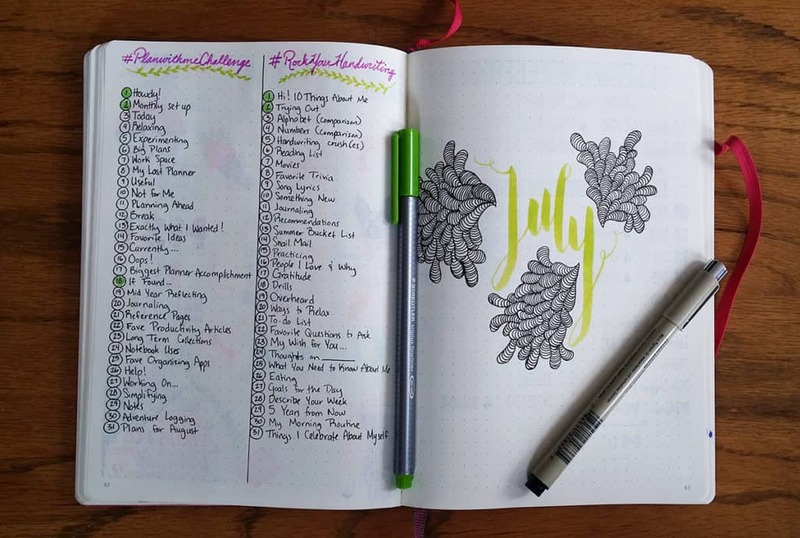 I like to draw mine out instead of listing the days because it helps me visualize the weeks. 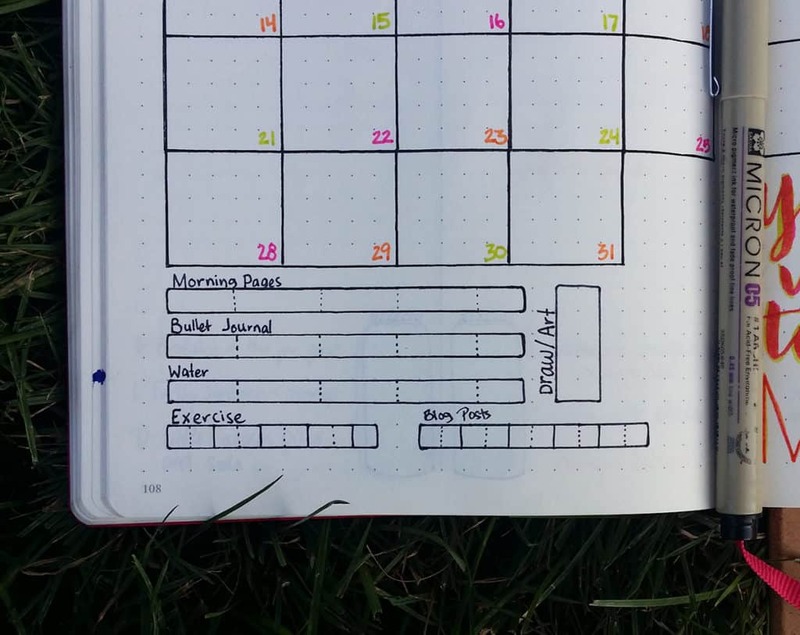 The Leuchtturm is a great journal for this because of that lovely dot grid paper – it takes so much less time to draw my calendar than plain or lined paper! A little ruler goes a long way, too. For months I have been lamenting the wasted space when I draw out boxes that don’t end up being days. Here’s last month’s, where I drew out all the boxes without thinking and wasted a ton of room on the page. I started to mindlessly draw those useless boxes this time, but I caught myself after one misplaced line. Can you spot it? 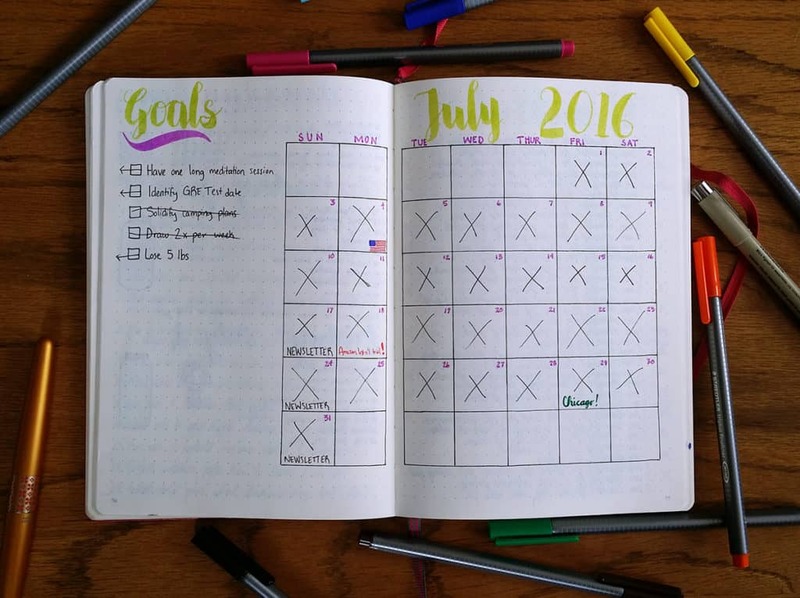 You might notice that I didn’t accomplish a single goal from my July goals list. Yikes. I’m gonna do better this month, okay? Camping isn’t going to happen before school starts, but we are making plans with friends for an autumn camping trip. So I’m not out of this ballgame yet! Speaking of outdoors, I really enjoyed doing my August monthly spread out in the August weather. It’s been super gorgeous here, so I took my artist’s tote board and hoofed it to the park. I would totally recommend it. Gotta get my rays somehow! I actually forgot to draw out my Reward Yourself progress bars last month thanks to this cumbersome calendar. I realized my mistake a few days later, but I never got around to putting them in. They were dearly missed! I didn’t feel nearly as accomplished this month and I think that had a lot to do with it. Well, I added them back in my August monthly calendar! All is right with the world. 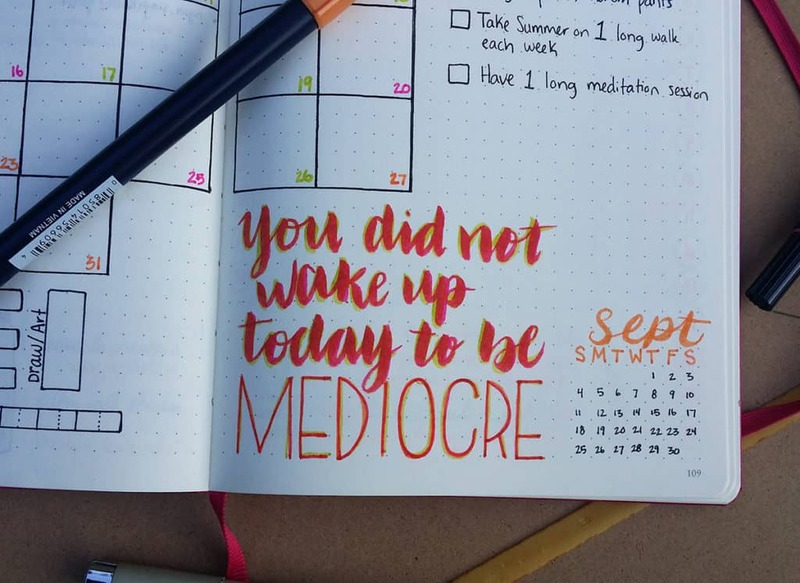 And here’s a happy little quote next to my September calendar thumbnail. I used my Tombows exclusively for the lettering this month. I’m really digging the color scheme and overall look. 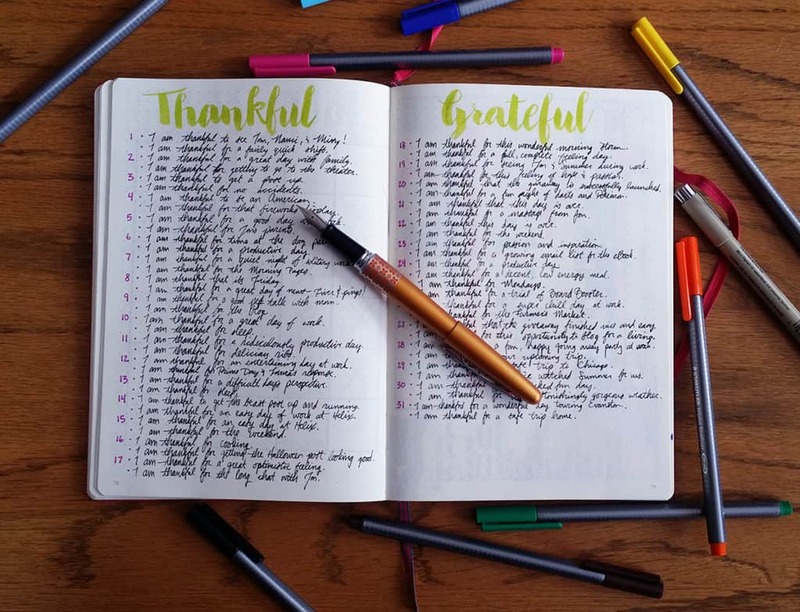 In the month of July, I did not do a great job of updating my Gratitude Log daily. I filled it eventually, but I want to really put in an effort to list something every night before bed. I did succeed with something else, though! 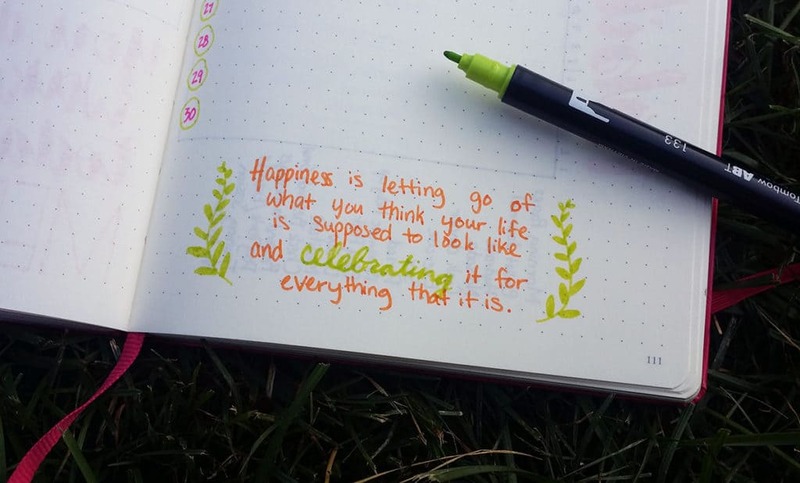 When I posted my July monthly planner last month, I mentioned that I wanted to make all my gratitude entries with one color pen for a consistent look. I am happy to report that I wrote with my Pilot Metropolitan every day and it looks wonderful! Gotta love that fountain pen feel. 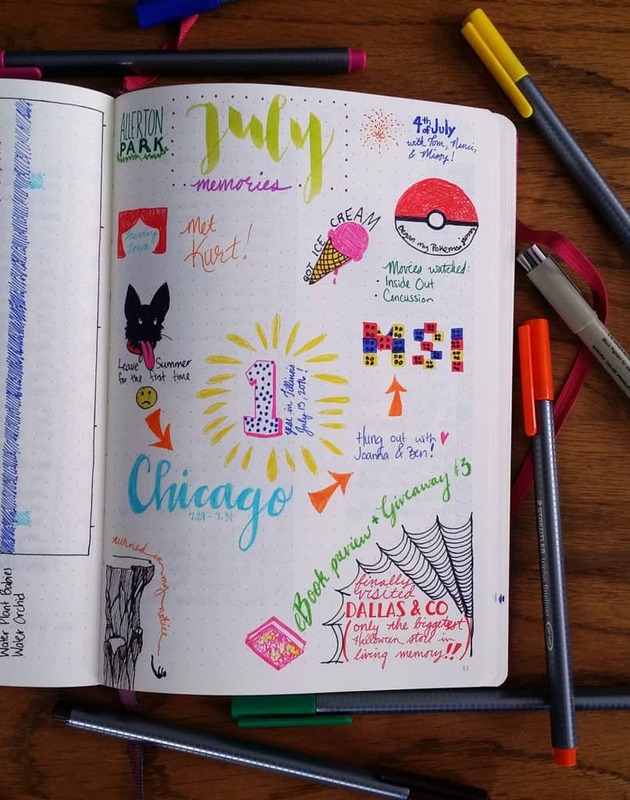 This month, I used a more colorful approach to my listings – again, it’s Tombows. I did a silly thing, though, and forgot a day of the month. While I normally would be able to just add another line, I had already added a quote to the bottom of the page. Oops! I’ll just have to write it on my daily when we come around to August 31st. You’ll notice that I also changed up the header. 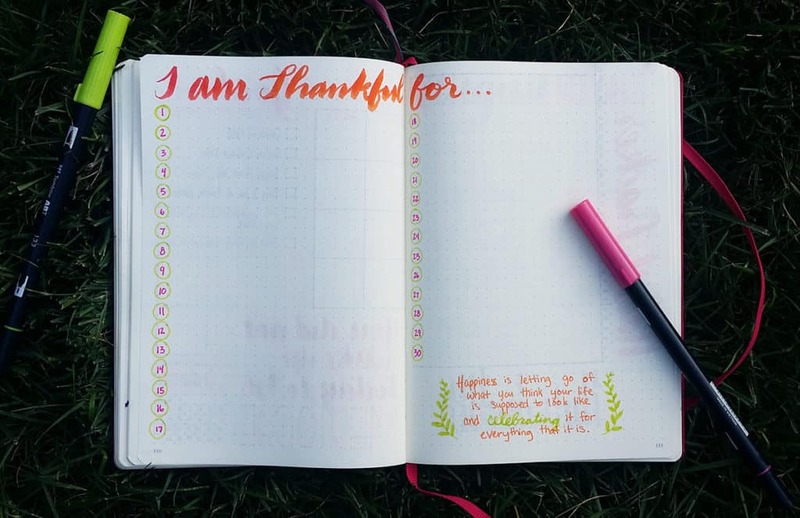 I nearly had a heart attack when I was closing in on the center of the notebook because I thought I was going to have to cut “Thankful” into “Thankfu”. Whew! By the skin of my teeth, people. 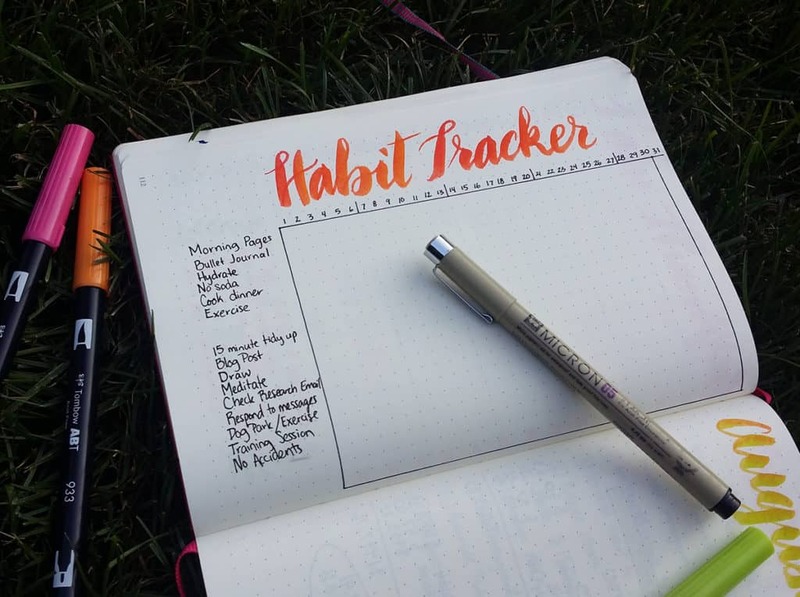 The habit tracker is where it’s all at for me. I love these things. I draw out my little chart with Micron pens and fill them out with the bright colors of my Staedtler Triplus Fineliner set. Being able to see trends and patterns is so wildly helpful. I can’t recommend this enough! 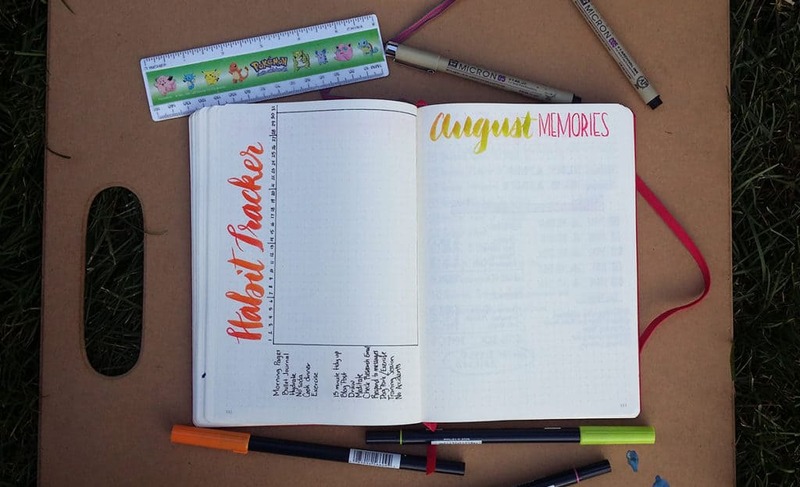 You should consider adding this to your August monthly planner if you haven’t already. It’s really quite fantastic. Last month went alright. We traveled or had family travelling to us a few times throughout the month, so habits were thrown out of whack a few times. That’s okay! Just a part of life, my friends. I’ll try to do better next month. You may be asking yourself what on earth those question marks are doing there. I added them because Summer stayed with a friend for a few days while we traveled to Chicago, so her patterns are a complete mystery to me. We’ll just start fresh this month. Puppy training in its finest! 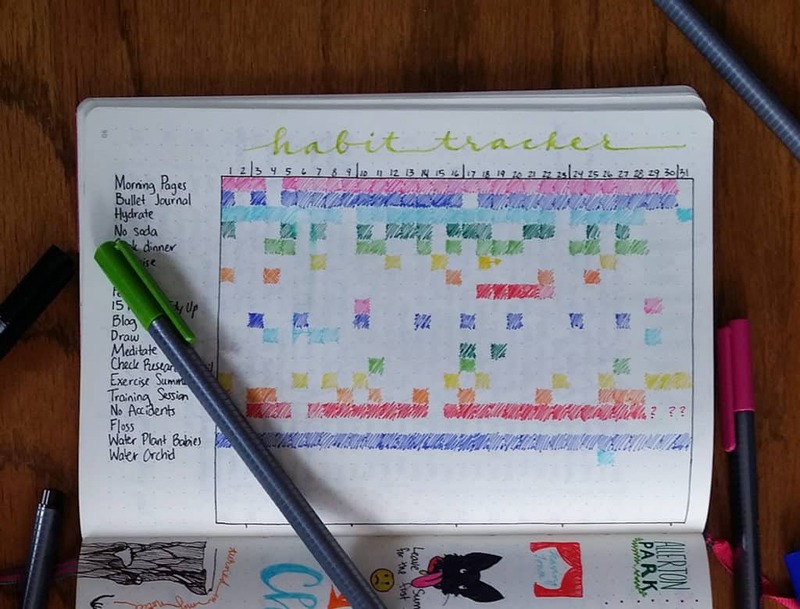 I have taken a few things off my habit tracker for this month because I either do them consistently or only once in a blue moon (I’m looking at you, Water Orchid). I still left room in case I change my mind or want to add other habits later this month. Yay flexibility! As for my memories page, that’s something I’m still unsure about. Conceptually, I love it! If you’ve read my Birthday Time Capsule post, you know I’m all about leaving breadcrumbs for future me. But taking the time to draw all my stuff out takes so long. I confess, I had a sticky note with all my memories jotted down here straight up until August 1st. Then I finally drew them all out, but only because I was procrastinating something else. I gotta admit, these Staedtlers were great for my memories page. I wish I had the big set (one day I will own thee). Though for my August monthly, I might try to do a little brush lettered blip about my memory instead of a doodle. I’m still noodling on it. Thoughts? Now here comes the big change in my August monthly planner. I am getting rid of my Instagram challenges page. In months past, I’ve had a whole spread dedicated to these challenges. But no matter how much effort I put into setting this page up, I never seem to do even a quarter of the prompts. It makes me feel crappy to have all of this unfinished stuff, and I don’t need that kind of negativity. So for now, I am going to put them aside and contribute if I feel like it. No obligation or feeling of failure. Boom. Oh, and I have this neat page from last month that I just decided to doodle on. I was hoping to get further into the doodle, but I think it looks pretty awesome. I used Microns, of course! 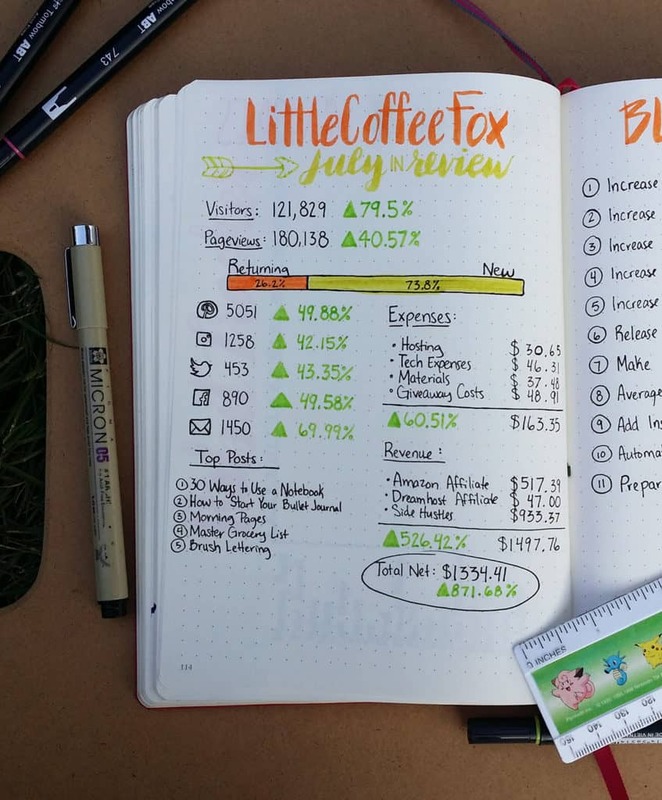 Bringing up the tail of my August monthly planner is my blog stats page. Last month, I had a huge increase in all my numbers and great success with my blog. So much success that I decided to finally quit my part time receptionist job and take on blogging full time. Starting my blog has been the best thing I’ve ever done professionally or creatively, and I would suggest my creative peeps look into starting one of their own (after all, you can get a $50 discount if you go through my link). 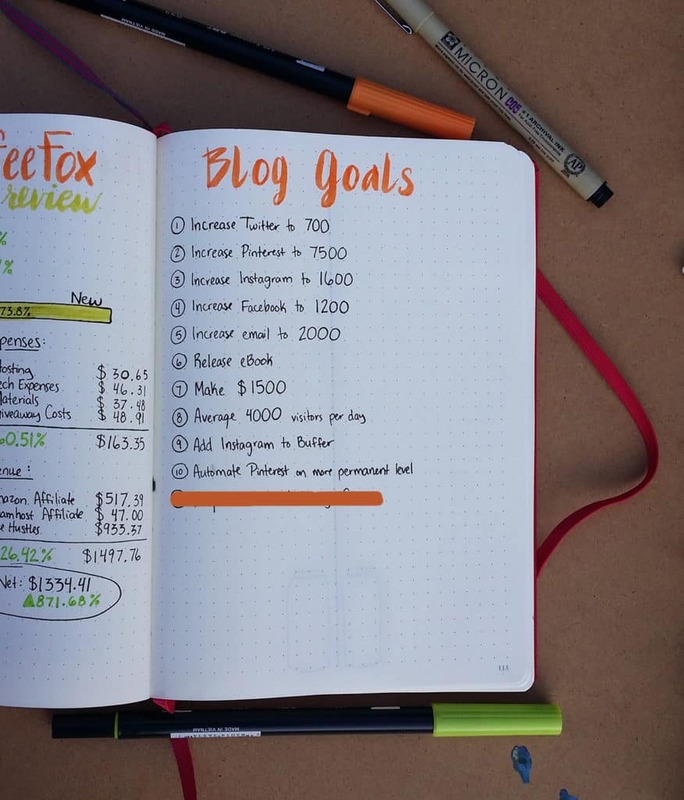 For the month of July, I only hit a handful of goals for the blog, but that’s okay! When I set them, I felt that I was hitting too many of my goals, so I upped them significantly to make them more of a challenge. Mission accomplished! Now I’m bringing them back down a little bit. It’s all about finding balance, my friends. Also, finding a definitive answer for #10 is a lot harder than expected. What is viable, anyway? I just left it blank and learned to be more specific next time. 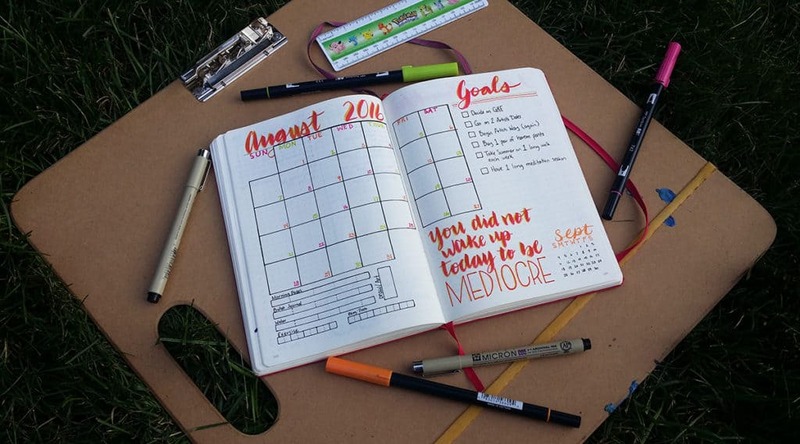 For my August monthly, I have my new numbers and new goals. Being that it’s my first month as a full time blogger, I want to really push and hit my goals this time around. The blog has continued to grow and be successful, and for that I thank you! You have been helping me discover myself and push me to new limits, and it is phenomenal. I can never express how appreciative I truly am! So that’s all I’ve got for you this month! I’ve learned some lessons after the downfalls of July and I can only hope that I can step up for August. What do you guys have planned for this month? How are you working toward your goals? Tell me in the comments! And if you want to track my journey with my monthly spreads, click right here to see all of them! « Vertical Dailies vs. Horizontal Dailies – Which is Better? I’m ready and it just turns out that we’re almost to the end of July so I am trying to be prepared to start with August, where can I find your printables for August? 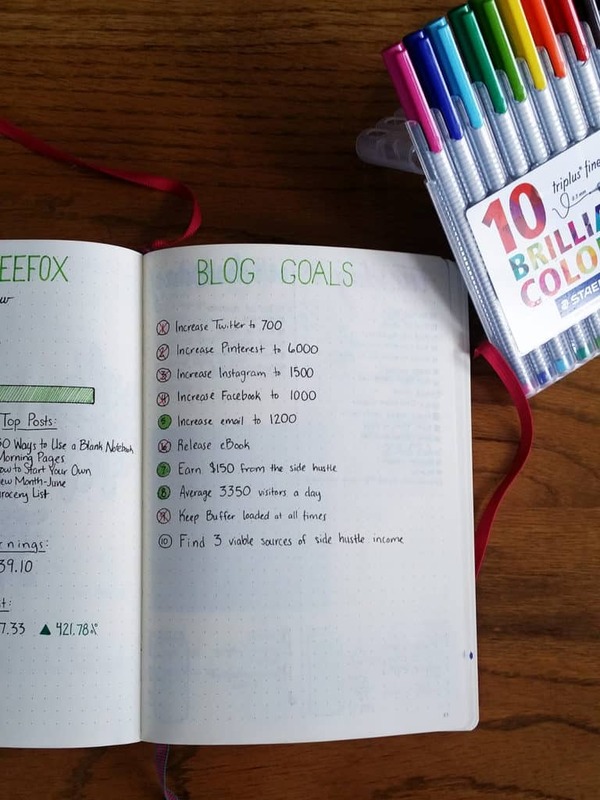 I love your style and think your blog is going to help me build the stamina and make my ‘bullet journal’ a ‘habit’! 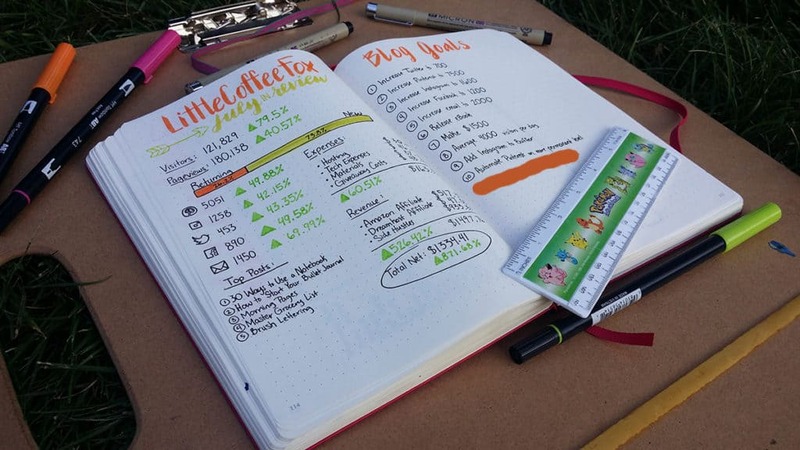 I wish you the best of luck as you continue your bullet journal journey! Thank you, I’ll let you know how it goes! I’m glad you liked it! It can take a few tries to really get into the habit of filling it out. I know it did for me! I wish you the best of luck giving it another shot!